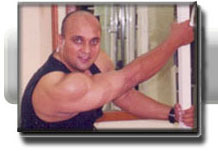 we maketh man and machines . .
His experience in the health, fitness and wellness fields spans well over 15 years. The training philosophy of abbas integrates with Western and eastern trainings principles and practices to promote a true mind/body approach to fitness through behavior modification. The diversified credentials of abbas had put him on the cutting edge of health, wellness and fitness today and he is grateful that this knowledge and experience enabled him to educate others on what he calls ‘The Path'. Abbas will help you reach” the path “to attain your healthy lifestyle goals.